This story can be viewed as a short story in its own right, but it is actually going to be the prologue for a book that is made up of lots of short stories that are woven into one larger story. I will post some more chapter excerpts later. I did submit it to be a part of a fantasy anthology to showcase authors on a fantasy group I follow on Facebook – but apparently it’s not good enough! I would appreciate some feedback guys. A subtle purple haze hovered imperceptibly in the air. A young girl sat on a porch swing, gently rocking herself, the motion of the swing lulling her into a state of daydream. She watched her baby brother playing in the garden with a spinning toy their father had made from an odd piece of wood from the log pile the family used as fuel. The spinning top had a magical quality about it. It hummed gently and seemed to spin on for the longest time; longer than she thought should be possible. 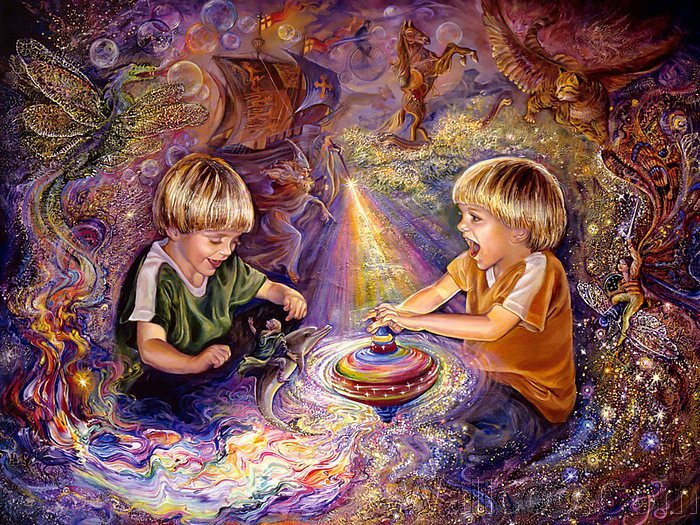 As it spun, the little boy giggled for a while at its unusual properties, but soon became bored with this game and jumped up; leaving the top spinning to run and play in the sand pit. The girl continued to watch the spinning top, wondering how long it would take for it to lose its momentum and stop rotating. Unsure of how much time had passed, she realised the top was still spinning and now the purple haze appeared to be gravitating around the toy. She sat up, now alert and aware that this was not an everyday occurrence and slowly and curiously walked towards the toy, unable to take her eyes from it. She wondered why it was still spinning and what was the purple mist that was now encircling the top? She looked all around her to see if anybody else had noticed this odd happening but her brother was busy digging in his sand pit and her parents were engaged in their own gardening activities. The purple mist around the top now began to glow, very gently, as if the dynamism of the spinning top was energising the very air around it. The humming was louder now. It was hypnotising and the frequency started to resonate inside the girl’s head. The top span on and on and then it began to rise in the air. She gasped and again looked around her to see if her family was watching this incredible occurrence. They were completely unaware of what she was experiencing. She wanted to call them to come and witness the event but for some reason the top was so hypnotising that she couldn’t look away or vocalise. She looked towards her parents and opened her mouth to call them but instead turned back to the top, suddenly not wanting to share this moment with anyone. Finally she felt the urge to touch the top and stop it from spinning, so she reached forward with the intention of plucking it from its place in the space in front of her. As her fingers made contact with the purple glowing air around the top there was a bright flash of light and a portal opened up in the air above the toy. Through the opening in Space and Time she glimpsed the view of an alien landscape. A rich and vivid scene of lush green meadows, bright blankets of exotic flowers in all the colours of the rainbow and some of which she didn’t recognise and a waterfall tumbling from a crystalline cliff face into a pool of pink liquid that then flowed into a river that cut the valley in half. Her eye was drawn to the sky where 3 suns of different sizes and colours could be seen – one red, one more orange than red and one a very bright yellow, almost white. She could also see several moons. The sky although mainly clear was blue, but had a very slight purple tinge to it and the clouds although your everyday white fluffy wisps, had a pinkish tint to them. And then a figure walked across her line of vision. A boy, a human looking boy about her age, but he was peculiarly tall and his skin was very pale and his ears were what she felt were elf-like. His clothes were like nothing she had ever seen before; the material had a shimmering rainbow coloured sheen to it that seemed to reflect the light in an unusual way, making the surface of his tight fitting shirt appear to move almost in a liquid like manner and the leggings, also tight fitting were silky white like some sort of satiny lycra, the sort of costume ballet dancers might wear, she considered. He was carrying what appeared to be a magical wand. She knew it was a wand and not just a stick because as he walked he waved it creating a purple haze like the one surrounding the spinning top and glittering flashes of some sort of energetic power fizzed in the air around him and the wand. Suddenly he turned and looked directly at her. Her heart jumped and she froze as the most beautiful piercing blue eyes locked with hers and she wanted to jump into the scene and embrace him. He was obviously as shocked as she was but he looked at the wand and then back at the rent in space/time and smiled gently and warmly at her. He waved and mouthed something but there was no sound and she couldn’t lip read – not sure she would understand him anyway even if she could. He winked in a very charming, cheeky sort of way and beckoned her to come to him. She pointed to herself as if questioning he could really see her and he nodded, offering his hand to her. She looked around at her family, apparently completely oblivious to what was going on and then reached forward into the strange hole in the atmosphere. The elfish boy stepped forward, took her hand and she tumbled through the portal into the strange fantasy landscape. They both sat up and looked at each other and then laughed pleasantly, which broke the awkward silence. He reached out and carefully touched her face and then she tentatively touched his pointy ears. She thought he was just so handsome. His face, although a very pale complexion was human none the less and he looked to be about her age, sixteen or seventeen. “My name is Eir. It means Mercy in your language. I am from the race of ljósálfar or Álfheimr, sometimes known as Alfr. Your people call us Elves – and this is Alfheim.” He made a large sweeping movement with his arm to show her his home. “It is beautiful Eir. But how did your father come to be here?” She asked him. Eir laughed quite pleasantly again, it was a beautiful and most honest laugh, she thought. He convinced her to carry on and sure enough soon they were entering a bright clearing amidst the dark trees and here there were many more elves and some fairies and other magical creatures, all sitting about chatting like any group of teenage friends in her own world would. They were laughing and joking and some were even showing off with their magic, casting spells that tricked their friends into falling off their rocks or giving them strange magical body parts or taking them away like magically removing a fairy’s wings! When they saw their friend Eir approaching with Emily they all stopped what they were doing and stared at her. They cast their spells to put each other right and just stood there staring at Emily, obviously quite shocked by her presence. There was a moment when nobody spoke, then all of a sudden the little clearing erupted in an explosion of concerned voices all trying to be heard above the other, voicing their concern about Emily’s presence. A young Elven girl spoke. She was so angelically beautiful that Emily was transfixed by her perfect face and piercing eyes, that, although looked slightly too big for her face, were just so beautiful. “Did you leave the portal open?” He shrugged and Emily said, “Well I don’t remember you closing it.” There was a momentary pause and then Eir and Emily turned to run back to the portal, with all the other magical friends following close behind. They could all see as soon as they had cleared the trees, that the portal was indeed still open and clearly visible. As Emily and Eir ran towards it they suddenly saw another figure approaching the portal from the opposite direction. “Oh that’s not good!” The pretty Elven girl that had spoken before said quietly. “And she does not like humans at all – especially men!” The Elven girl added. “Why not?” Emily asked feeling more than a little bit nervous. Eir raised his wand and frantically cast a spell. The purple magic shot out of the wand and zoomed off towards the Elven Queen who turned towards the group and the magic winging its way to her a moment too late. She raised her own wand to counter the spell just as Eir’s magic hit her full on and she was immobilised – frozen in time. Eir pulled his hand from Emily’s and she held on to his fingertips just a moment longer, not wanting to let go. He raised her hand up to his mouth and kissed it gently then pushed her through the portal. As she fell through into the garden she saw her father look up from his gardening at her and the shock on his face as he saw Alfheim behind her and the frozen Queen Margarita also behind her. She saw him mouth the Queen’s name “Margarita” and then look towards the axe on the wood pile. Emily ran towards the axe and grabbed it quickly, then turned and threw it through the portal just as it was closing. Eir caught the axe and blew Emily a kiss. Then he was gone and Alfheim was replaced by her garden once more. She exchanged a knowing look with her father and a smile and then he carried on with his gardening. Emily picked up the spinning top and took it into their huge rambling old house, climbed the staircase into the large attic and hid the spinning top in a box sitting on an old rocking chair. The box contained an old camera, a gramophone, her great grandmother’s music box and a few old pieces of jewellery and ornaments. She didn’t see as she left the attic how the spinning top was still radiating with elven power. It seemed to leak its power over all the objects in the box and the rocking chair before the magic dissipated into the atmosphere of the attic. Emily didn’t see the objects in the box for a moment glow with a curious purple aura and then return to their normal state, just random objects in an old attic in a very strange old house.